Surgical Innovations - Isabelle Chumfong, M.D. Surgical Innovations » Education & Training » Resident Q&A » Isabelle Chumfong, M.D. SmartDerm is a real-time monitoring and management device for pressure ulcer prevention. What drew you to engineering and medicine? My path to medicine was more circuitous. [After getting a master’s in engineering] I took a job doing Homeland Security research, modeling bioterrorism attacks like anthrax. I was embedded with a public health department. I knew I didn’t want to spend the next 40 years preparing for attacks that I hoped would never occur. I started volunteering at the Berkeley Free Clinic and saw how empowering it is to educate people about their health, and that’s how I became interested in medicine. Why did you choose UCSF for residency? UCSF has this outstanding program with lots of women in leadership positions and diversity in the faculty. Also, there are very few places in the country where you can pursue innovation as your research interest. Could you talk about your work as a medical fellow at IDEO? IDEO (ideo.com) is this amazing design and innovation firm. Their early work includes the first Apple mouse and the concept for the first laptop computer, and nowadays they do a lot of consulting on medical devices and health care. I spent a few months advising on their projects, serving as a translator for some of the medical jargon and describing how things work in a clinical scenario, because I have the experience of spending day in and day out in the hospital. In turn, what I learned is their whole process of “design thinking”: how you go from understanding a problem and your users, to making an elegant solution that fits what those users need and solves the problem in a unique way. 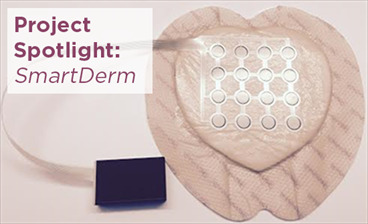 How have you applied what you learned at IDEO to your work at UCSF on the SmartDerm project, a “smart” bed sensor that helps prevent bedsores? In medicine, we’re hardworking people who don’t take shortcuts, so when we don’t have time to innovate, we can tend towards more and more laborious solutions as long as they “get the job done.” For years, nurses have been amping up their labor and process measures to prevent hospital-acquired pressure ulcers. They’re always turning patients at high risk, which requires two or three staff members to avoid injury. All our past solutions have been to add more people, more time, more eyes. But the design thinker’s approach would be, “What are we really trying to solve?” If it’s understanding how pressure ulcers form and how we can intervene earlier to prevent them, there’s probably a smarter way to do that. I joined the SmartDerm team about a year into their research. They had been developing sensors that are supposed to detect pressure, and had spent some time mocking up how they imagined the sensors might be used. But they are a team of engineers who had never been in a hospital or talked to nurses. And nurses are the frontline people who have been fighting this battle. That was the lightbulb from my time at IDEO. I immediately gathered the whole team and arranged for several trips to the hospital, and set up interviews with nurses and patient care assistants to try to understand how preventing pressure ulcers fits in with all the other work they do and care they give all day. How can we make sure that we don’t make just another so-called “smart” device that ends up sitting on the shelf, because it doesn’t improve patient care or offer any advantages to the nursing staff? It seems like thinking about the whole context and ecosystem in which it will be used is an integral part of designing something. Right. What I learned at IDEO is to prototype quickly and with low fidelity so you can get user feedback in the earlier stages. We made mockups and showed [the nursing team] really rough sketches, and got some great feedback early on about what information they wanted to see, when and how they wanted to be notified, and the “pain points” that occur when they try to comply with the current best practices for preventing pressure ulcers. For example, right now they have a system for photographing patients’ pressure ulcers that is pretty “painful.” Nurses have to get a designated digital camera, take a photo, print it, and put it in the patient’s paper chart, which we don’t even use anymore – we use electronic charts. From that conversation, we came up with the idea of including an application within our sensor’s software to digitally take photos and have them appear in the patient’s [electronic] chart. In a way, part of the design work is making it easy to do the right thing. Exactly. Nurses are really busy. If you have a really sick patient and you’re just struggling to keep up with their medications and other needs, taking certain incremental actions to help prevent a pressure ulcer can fall lower on your list. We can help a nurse triage which of her patients are at highest risk of pressure ulcers by providing her with pressure over time measurements, in the same way a pulse oximeter can serve as an early warning system to let us know if a patient’s oxygenation is poor. One of the financial motivations for hospitals is that Medicare doesn’t reimburse anymore for hospital-acquired pressure ulcers. If we can reduce the incidence, we save a lot of hospital days for a patient and a lot of money that would have been spent on pressure ulcer-specific treatment and care. My hope is to combine a career in academic surgery with working on devices and innovation. This is a new pathway, but luckily for me at UCSF, I have role models who are working in this space. Do you know what area of surgery you might want to specialize in? I like pediatric surgery. Some surgeons say that it’s the last area of true general surgery. You get to operate in the chest and the abdomen. There are a lot of really interesting complex reconstructive procedures – fixing congenital abnormalities, removing cancers – but also a lot of simple bread-and-butter surgery, like removing appendixes and fixing hernias. UCSF is also the birthplace of fetal surgery; there are some exciting things going on there as well. And then I like kids. What have been some highlights of the Surgical Innovation Program? A couple of weeks ago we had this great guest lecture by the innovations leadership from a large medical device company. Afterwards, in a small group session, we talked about how you get from your idea and some initial rough prototypes to something that you can test and seems like a feasible device. It’s one thing to read a textbook on how to do this, but it’s much better to sit down with an expert in the field and specifically discuss your ideas and device and get one-on-one time and feedback. It’s really meaningful to have a discussion in the context of a project that you’re working on every day. And because our Surgical Innovations group meets twice a week with lots of people both within and outside of UCSF, it’s been essential to my establishing a network of mentors and colleagues. What is especially nice about having these two years to do research and innovate is that I get to step back, spend time looking creatively at problems I’ve seen on the ward or in the operating room, and attempt to solve those problems in a way that we haven’t thought about yet.